Americans spend billions of dollars each year on cleansers, toners and scrubs to improve their complexions. These chemical-based products often contain harsh alcohols and soaps. 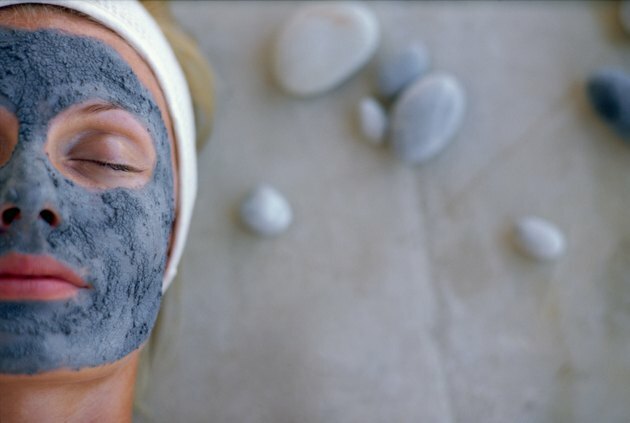 Bentonite clay is an alternative facial treatment. The mineral gets its name from its source -- it is harvested from soil near Fort Benton, Wyoming. Botanical.com writes that when it is taken internally, bentonite clay can help the body rid itself of toxins in the gastrointestinal tract. Its detoxifying properties are extended when applied to the skin. Acne is caused by the overproduction of sebum, oils that keep the skin moisturized. When too much sebum collects on the skin, it can clog pores and cause the formation of blemishes. A study published in the February 1983 "Journal of the American Academy of Dermatology" used bentonite clay on mesh gauze for absorbing sebum to determine the skin's secretion rate. The study showed that subjects with acne inflammation secrete three times as much sebum as those with clear skin. Bentonite was the clay of choice for the scientific group, due to its electrical properties. When mixed with water and applied to the skin's surface, its molecules become charged and draw out toxins from beneath the skin. Edema, or the swelling of soft tissue beneath the skin, is caused by fluid and sodium retention, and is often a sign of a serious medical condition such as congestive heart failure or kidney problems or a side effect of medications. Botanical.com reports that bentonite clay "swells open like a highly porous sponge," sucking up water, binding to excess sodium and eliminating toxins. Eczema and psoriasis are skin conditions caused by fungal infections on the surface of the skin. According to a study published in the "Journal of General Microbiology," most fungi carry positive charges. A negatively charged bentonite mask, when applied to the skin, can help to heal these infections by attracting and absorbing the fungus. Activated bentonite clay assists the body to heal and regenerate skin tissue. In a study reported in "Acta Medica Iranica," Iran's major medical journal, rats inflicted with a 1 cm round wound were twice as likely to heal within a seven-day period after bentonite clay treatment than the untreated animals, and three times as many rats with induced 1 cm incisional wounds healed within seven days after bentonite treatment compared to the untreated control group.